From hiking the mountains of New Zealand to following in the footsteps of Jesus in Israel, Samford University senior Emily Ehrnschwender has defined her college experience by taking any opportunity to travel that comes her way. Ehrnschwender, who plans on pursuing a career in data analytics after studying economics, mathematics and statistics in the Brock Scholars program, sees each of her travel experiences as an opportunity to grow and learn. 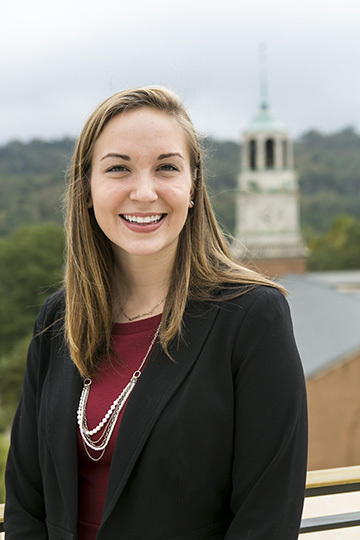 Brock Scholars is the honors program in Samford’s Brock School of Business. When Ehrnschwender moved to New Zealand for the spring semester of her junior year, she had no idea what to expect. While there, she took courses in modeling and regression, behavioral economics and computer programming. New Zealand was not Ehrnschwender’s first experience traveling internationally. She spent the summers after her freshman and sophomore years interning on Eleuthera Island in the Bahamas with Bahamas Methodist Habitat, a construction-based disaster relief program. Through this opportunity, she learned nonprofit management skills by coordinating activities and logistics for more than 400 volunteers each summer. “My leadership skills grew tremendously throughout that experience and, most importantly, my confidence in my leadership grew,” said Ehrnschwender. Brock School of Business has given her opportunities to travel within America as well. Ehrnschwender was part of the group that traveled to Omaha, Nebraska, last fall for a question-and-answer session with Warren Buffet. She also traveled to Boston the summer after her sophomore year to participate in a National Association of Business Economics conference on the intersection of big data and economics. Ehrnschwender has accepted a full-time position after graduation as a strategy consultant for StrategyWise in Birmingham, where she has worked as an intern writing and researching, as well as assisting with overall business strategy development. Most recently, Ehrnschwender spent Jan Term studying in Israel with Samford, touring the places where Jesus lived and taught, and gaining an understanding of the political happenings in Israel and the Middle East. Through every travel opportunity, both nationally and internationally, Ehrnschwender has pushed and challenged herself in ways she did not know she could. Victoria Shelton is a journalism and mass communication major and a news and feature writer for Brock School of Business.